LANCET HEAD DOORWAYS. This pair of medieval style oak doorways are furnished by a fabric of wool/linen, from a 16th century German design, called Dragons and Owls. 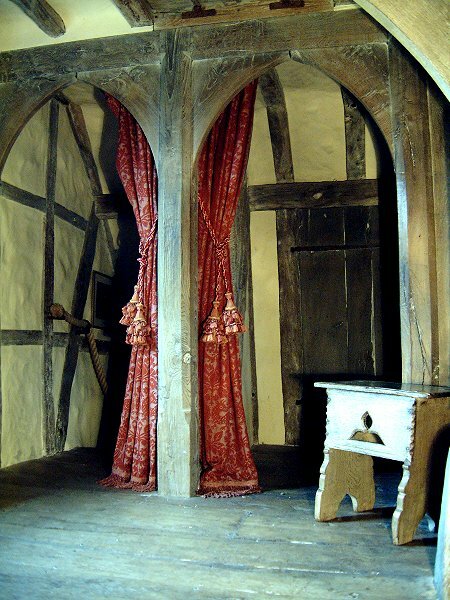 As with the bed hangings, they are lined with linen union and hung from iron rings and rails. The bullion fringe on the bottom edge falls fully onto the floorboards, helping to keep out draughts, and centuries ago was considered a sacrificial item, to be replaced as it wore out, thus preserving the more expensive fabric.